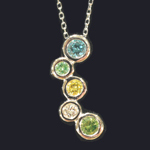 Fine Jewelry And Gifts For Three Generations! 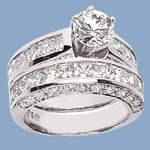 Welcome to the D & M Perlman Fine Jewelry and Gifts website! Here you will find many of the beautiful and exclusive high quality products that have distinguished our family’s business from the more ordinary jewelers and chain stores for nearly 60 years! In the drop-down menus, you will find each of our different departments and categories. Our Engagement Ring and Wedding Band Department features over 1,000 pictures of name-brand designs as well as our own exclusive custom creations! Our Estate Jewelry Department offers a never-ending array of colored stone, diamond, and pearl jewelry, all priced at 60% to 70% off! Our Colored Diamond Jewelry, Birthstone Jewelry, and Sterling Silver Jewelry Departments are also extremely popular jewelry categories. 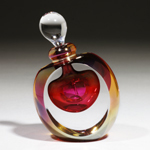 Our Gifts Department includes name-brand collectibles, American art glass, men’s Vitaliano Pancaldi silk ties, clocks, jewelry boxes, and so much more! 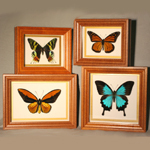 Our amazing Wonders of Nature Department includes professionally matted and framed butterflies, bats, and exotic insects; fossils and mineral specimens; and other natural art pieces. 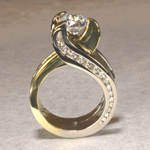 Our Services and Repair category highlights some of the many custom designing and in-house jewelry and watch repair services that we offer. To see even more of the items we carry, visit and “Like” our Facebook jewelry page! New pictures are added every day! To learn more about our history and philosophy, visit the About Us page. We hope that you enjoy your on-line visit, and we’re looking forward to seeing you in person!! 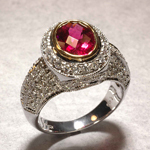 We’ve been chosen to be the area’s exclusive dealer of a new, high fashion designer colored gemstone and diamond line! Uniquely faceted stones, like rose-cuts and oblong ovals, along with combinations of black rhodium and pastel gem shades are what attracted us to this newest and most innovative New York designer! Stop in soon to see the entire collection! We pay up to 50% more for your gold than many gold-buying stores because we’re a jewelry manufacturer and gold recycler! We also pay the most money for your diamonds and colored stones too. Stop in today to convert your gold to quick spending cash. Click on the gold chest for more information! Like us on Facebook to see our up-to-the-minute status and new merchandise images! 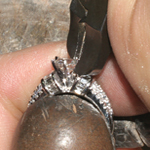 Watch videos, see how custom pieces are made, give us your input and tell us how we’re doing! Just click the images to the left, or follow these links: dandmperlman and WondersOfNatureAtDAndMPerlman Join our monthly mailing email list to receive future exclusive discount coupons, information and special offers from D & M Perlman. Some special offers are available to email members only. Click here to Join.